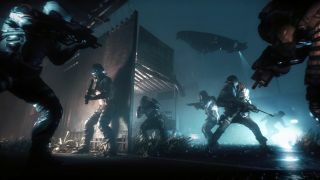 Homefront: The Revolution is coming out in a matter of weeks, and as far as games set in dystopian urban environments go, it definitely appears to fit the bill. Gruff military guys bark orders, punkish sidekicks deliver snarky quips, there's an abundance of serious acronyms and there's lots and lots of shooting involved. As typical of the genre as it may be, Homefront does look like a blast: the trailer above outlines some of the different areas of Philadelphia you'll visit, and the things you'll do there. You'll free up safehouses, strengthen your hold on various zones, and plant traps to take out heavy duty military vehicles. Oh, and you're able to broadcast propaganda as well, in order to make people trust The Resistance, which is the organisation you're shooting things on behalf of. The Homefront release date is May 17. There's plenty more footage out there if this isn't enough: here's six minutes of footage from mid last year, and here's a trailer which explains who the Apex Corporation is.